This is what they look like before going in the oven. Usually I’d also have a picture of what they looked like when they came out of the oven, but they all got eaten before I got a chance to take a good shot. Too bad, because they were really gorgeous. Oops. This recipe is a marriage of two indulgences: my double chocolate muffins and Nutella . They are full of hazelnuts (or filberts, if you prefer) and chocolate in multiple forms. Hazelnut/filbert flour is available in some specialty stores, but you can also make it at home in a blender or coffee grinder. To get what you need for this recipe, pulse a scant cup of hazelnuts for 10 to 20 seconds (depending on the speed of your device) until the hazelnuts are reduced to a coarse meal (powder) with some larger chunks. Do not overblend, or the mixture will turn into hazelnut butter: delicious, but not usable for this recipe. Scoop out the larger chunks and set them aside; they are your ¼ cup finely chopped hazelnuts. Sift the rest through a coarse sieve; that’s your ½ cup hazelnut flour. I lightly rub the hazelnuts together before blending or chopping them to remove the reddish-brown skin, which has a somewhat bitter taste. I’m not too picky about this, though – Bob’s Red Mill skips this step when making its own hazelnut flour. If a skin is hard to remove, I leave it on. Like my double chocolate muffins, these muffins aren’t super-sweet. That gives them a nice, dark chocolate flavor that beats Ferrero Rocher any day in my book. If you’re looking for something more cupcakey, you can double the sweetener – but why not try it this way first? Mix the hazelnut flour, wheat flour, cocoa, sugar or xylitol, baking soda, baking powder and salt together in a large bowl. Add the wet ingredients to the dry ingredients and mix until all the dry ingredients are moistened. Batter should be somewhat lumpy. 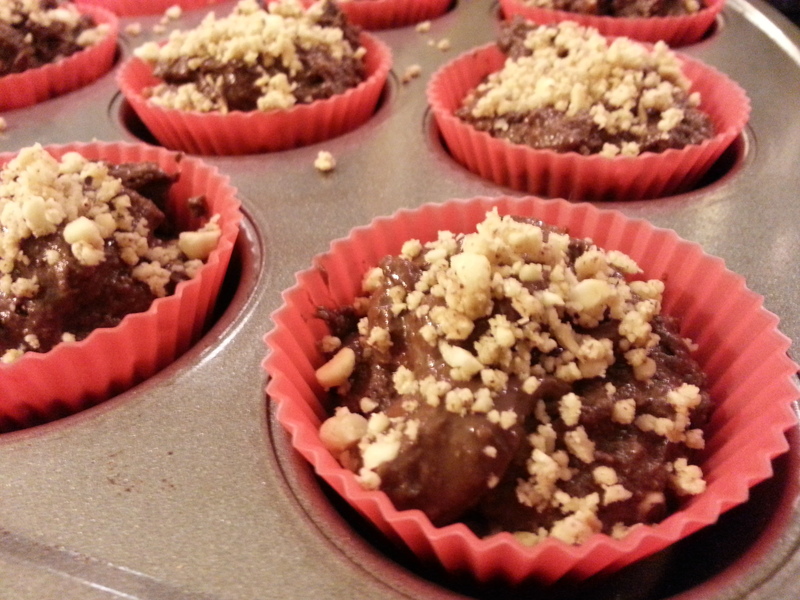 Stir in the chocolate chunks and ½ cup coarsely chopped hazelnuts. Sprinkle the ¼ cup finely chopped hazelnuts over the muffin tops. Bake at 400°F for 20 minutes, or until the tops are firm and toothpick comes out clean.